Thunder Spark challenges Yuma Tsukumo to a "Speed Duel". A Speed Duel (スピードデュエル Supīdo Dyueru) is a new type of Duel introduced in the Yu-Gi-Oh! 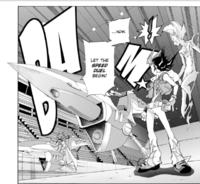 ZEXAL manga by Thunder Spark. It is similar to a Turbo Duel, but played in the Speed Field. In a Speed Duel, both duelists Duel in a Speed Loader which is similar to a Duel Runner, but with a most futuristic design. The vehicle is also able to ride over the water. Both players begin from the starting line and ride towards the goal. If a player's Life Points are reduced to 0, they lose. If a player crashes, they lose. The player who passes the first corner takes the first turn. The player who is ahead of the opponent can Normal Summon twice during their turn. ↑ Yu-Gi-Oh! ZEXAL Rank 13: "The Second Assassin!!" ↑ Yu-Gi-Oh! ZEXAL Rank 15: "A Shared Bond!!" This page was last edited on 15 December 2013, at 02:52.